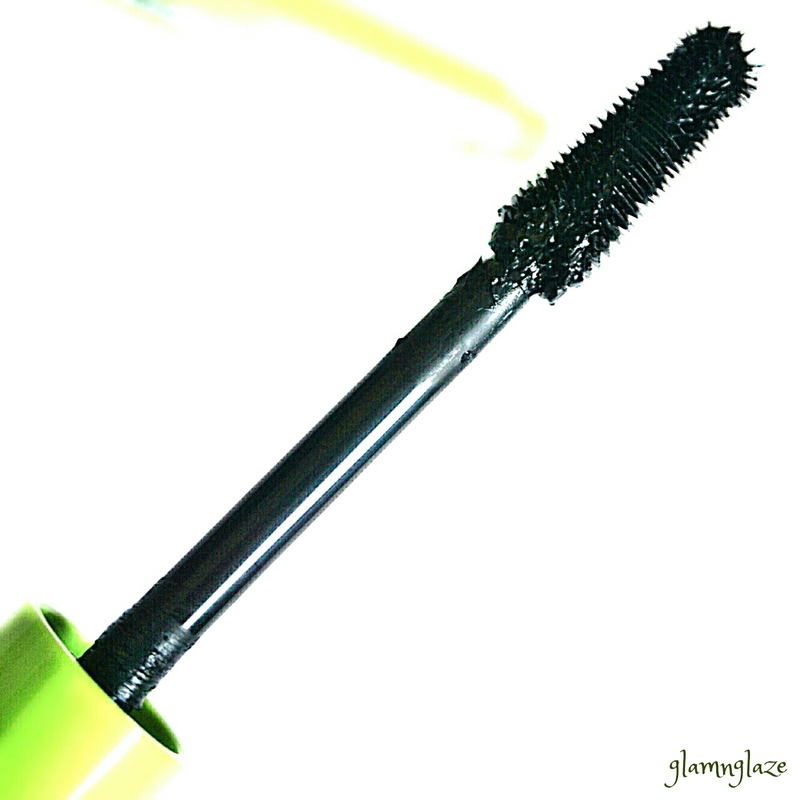 Today, I am going to share my thoughts on the GOSH's Boombastic Swirl Mascara Spiral Volume XXL.Shade name : Carbon Black. Boombastic Swirl Mascara gives lashes XXL volume and spectacular length. XXL Swirl up volume and spectacular length and a giant swirled rubber brush are the keywords of the new Boombastic Swirl Mascara. 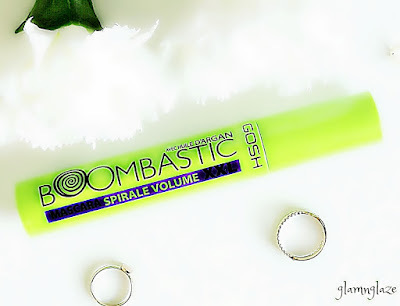 The formula of the Boombastic Swirl mascara is full-bodied, creamy and really spreadable. It blackens and thickens the lashes without making them look clumpy or spidery. The added Argan Oil and Bamboo Extract gives lashes a boost whilst a synergy of waxes and olive oil adds nourishing properties to the formula. The vibrant green container reflects the infused bamboo extract while the artwork brings the swirled brush to mind with the discreet swirled O in Boombastic. 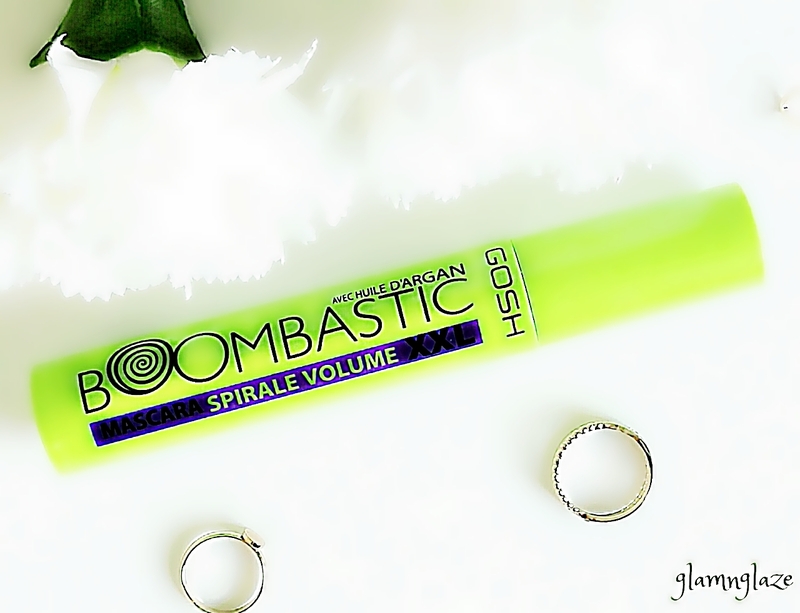 The present Boombastic mascara is one of the bestselling mascaras within the GOSH Cosmetics mascara assort­ment and with the new Boombastic Swirl Mascara now added to the Boombastic mascara range, anyone can find a Boombastic mascara for every look and mood. A giant swirled rubber brush with bristles at the tip grabbing even the tiniest lashes for application. The unique spiral shaped combination of bristles and discs creates spectacular volume and length. Aqua\Water\Eau.CI 77499\Iron Oxides.Copernicia Cerifera Cera\Copernicia Cerifera (Carnauba) Wax\Cire de carnauba.Oryza Sativa Bran Cera.Stearic Acid.Acacia Senegal Gum.Butylene Glycol.Palmitic Acid.Hydrogenated Olive Oil Stearyl Esters.Glyceryl Stearate.VP/Eicosene Copolymer.Polybutene.Synthetic Beeswax.Aminomethyl Propanediol.Phenoxyethanol. Ozokerite.Hydrogenated Vegetable Oil.Argania Spinosa Kernel Oil.Hydroxyethylcellulose.VP/VA Copolymer.Glycerin.Stearyl Stearate.Bambusa Vulgaris Extract.Tropolone. The first thing that attracted me towards this product was the packaging indeed.The vibrant neon-green coloured bottle looked amazing and appealing.The details like quantity,shelf-life and shade name are mentioned on the packaging itself.The twist open cap is easy to remove.The mascara-applicator is very different and swirly unlike any other normal looking mascara.Interesting. Sturdy and travel-friendly packaging.Easy to carry in your handbag. The formula is neither very wet nor dry,it's just somewhere in between and perfect.It's well balanced. It dries quickly.The moussy-textured mascara is nicely pigmented and easy to work with. Need to apply a coat and then wait for it to dry.Then re-apply the product on the lashes.This ensures that we get that desired length. Firstly, the formula is so nice that it becomes very easy to play with the mascara. 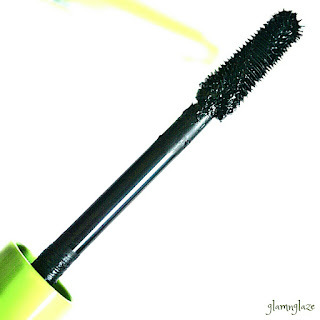 The wand is long and the swirly-bristles help in coating each and every eye-lash. The bristles at the front of the applicator helps in reaching out the lashes around the inner corner.Be careful and do not poke your eyes. Applying two to three coats of the mascara helps in getting lengthened lashes. In order to get volume, we need to apply the mascara for about three to four times. It holds the curled lashes very well. Smudge-proof : Didn't smudge a bit and stayed put whole day. Didn't flake at all.Avoid layering a lot of product,else, It will certainly flake. Key Ingredients : Argan Oil and Bamboo Extract improves lashes - volume and vitality and makes them stronger.Argan Oil helps in strengthening the hairs in the long run and bamboo extract keeps the lashes moisturized.How cool is that! Makeup that has skincare-ingredients.Amazing. It's water resistant to a great extent.Not really waterproof as such.Not that easy to remove using lukewarm water.Need to use a good makeup remover. The actual applicator is very huge and it becomes very difficult to push into the bottle at times.Be patient. No, as I wanna try other mascaras from the same brand. I had tried Crazy Volume mascara earlier and liked it. 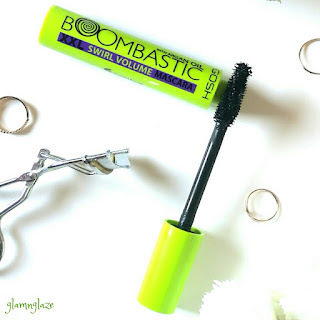 But, I recommend Boombastic Swirl mascara to people who are looking for a decent mascara that gives average length to their lashes.It separates the lashes beautifully.Holds up the curls well. In UAE,Lifestyle , Centrepoint stores.